Accommodation including breakfast in Kathmandu. All meals and lodges while on trek. Langtang, Gosainkunda, Helambu trekking provides the finest view of the landscape and chances of exploring the surrounding. After entering into the valley we can explore the main highlights of the trek are Valley of Langtang, Langtang Lirung (7246m. ), Dorje Lakpa (6966m. ), Gang Chhenpo (6388m. ), Yala Peak (5700m. ), Naya Kang (5846m. 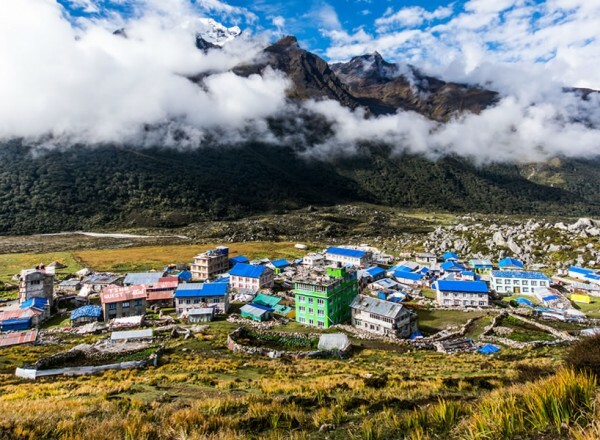 ), villages of Tibetan and Tamang settlements, along with the close-up view of Ganesh Himal, Shishapangma, Manaslu, Pemathang Ri, Langshisari etc. The flow of numerous streams and cliff of rocks amuses for those who love nature and the magic of it. Varieties of rare wild life, like Himali Black Bear, Red Panda, Langur Monkey, Wild Boar including 283 spices of birds , 32 mammals and the gigantic view of snow-capped mountains, grassy meadows and valleys with the blossoms soothe tiredness make refreshed during trek. This trek can be arranged in a short holidays to spend with enough adventures. The plan of the trek can be one of the most adventurous ever in life. Helambu, Gosainkunda pass, Gangajal pass and Langtang valley are some of the popular trekking routes for the adventure lovers. Gosainkunda lake is holy lake for the Hindus and Buddhists pilgrimage. Upon arrival in Kathmandu airport. Our representative will picks up you from Airport and transfer to Hotel. Evening welcome dinner. Today you will have option for the sightseeing or preparation of trekking on your own. 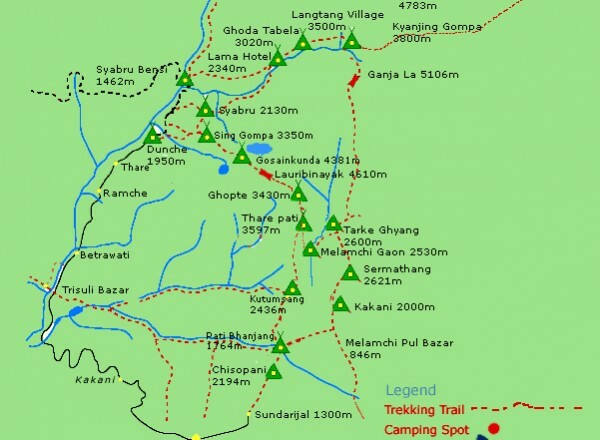 After breakfast, we begin our trek to Lama Hotel along the Langtang Khola (river). We will cross through Oak and Rhododendron forests. After crossing a bridge over the Langtang Khola and some walk we will reach atLama Hotel. Overnight in Lama Hotel. After breakfast in Lama Hotel we continue our journey to Langtang village. Along the way we will see the mountains, landscape and waterfalls. After reaching Ghoda Tabela, we begin to see the white peaks of the Langtang range. Our trail continues to climb up the widening valley called Langtang valley which was destroyed by the earthquake on 2015. After some hours walk from there we will reach Mundu village where we have overnight. After breakfast, we will start our journey to Kyangjin Gompa, where there is the famous monastery of the region. We passed by water mills, prayer wheels and chortens. We spend rest of the afternoon exploring the Buddhist shrine in Kyangjin Gompa and surrounding areas with the beautiful mountain views. Today we spend the time climbing and roaming around Tserko Ri from where we could see the best sunrise view. We get back to Kyangjin Gompa by late afternoon and explore the beautiful monastery when time permits. After breakfast, we begin our return journey to Lama Hotel. 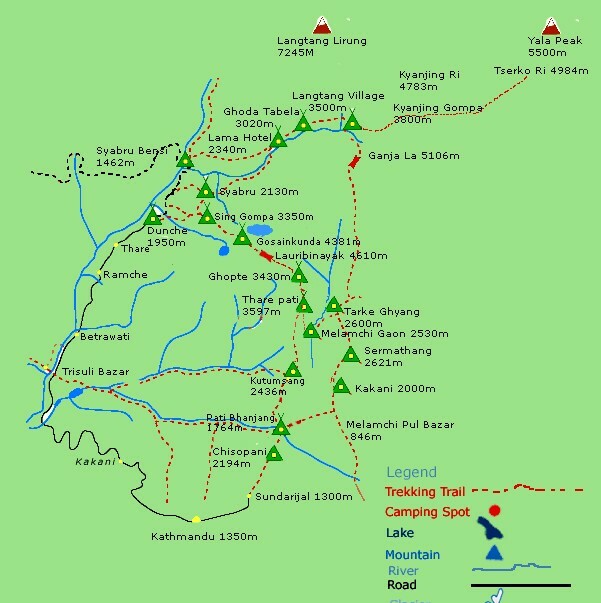 Most of the trekking today will be downhill as we pass through forests and beautiful Tamang villages. After breakfast at Lama Hotel weclimb up to the Rimche Village. From here we descend to Langtang Khola and continue our trek to Thulo Syabru. Overnight in Thulo Syabru. After breakfast you may take a short rest today because we have short walk only because we will go to Gosainkunda the next day so that we should acclimatize better to the high altitude. After trekking for a while we pass by a chorten, Garta Village and Phulung Monastery. Overnight in Shin Gompa. Today, we have a chance to see many mountains including the Annapurna, Hiunchuli, Manaslu, Ganesh Himal and Langtang. We follow a ridge for the most part of the day and catch a glimpse of the first of the holy lakes. The third lake, Gosaikunda (4380m), is of particular religious and cultural significance for the Nepalese and is one of Nepal’s most sought after pilgrimage sites. Overnight in Gosaikunda. After breakfast we walk around the lake and before ascend towards the Laurebina Pass (4610m) from where the Helambu region begins . Our trail passes through Surya kunda before reaching Ghopte. Overnight in Ghopte. After breakfast at Ghopte, we walk uphill and downhill on a trail that passes through dense forests which will take us to Thare Patt, which is the small village in that region. We cross suspension bridges before reaching Melamchigaon We will have chance to see Monastery there. Overnight in Melamchigaon. Today our trail passes through forests that lead up to Ama Yangri (3,800 m) which is the highest point of our trek today where yew will stupa and Buddhist prayer flags. We will also see Mt. Shishapangma of Tibet and the Langtang ranges. After that we will walk some hours to reach at beautiful Sherpa village called Tarkeghyang . Overnight in Tarkheghyang. After breakfast, the trail is easy and passes through lush forests. We also pass by beautiful villages, chortens, monastery and mani wall before reaching Sermathang. 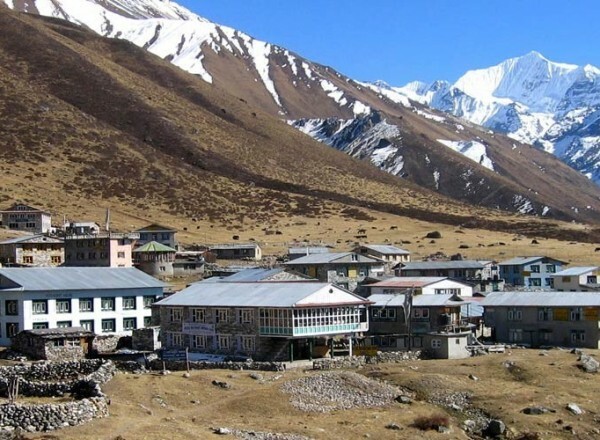 which is also a beautiful Sherpa Village from where incredible views of Ganesh Himal, Jugal Himal and Langtang ranges. Overnight in Sermanthang. Today is our last day for the trek. Our vehicle is waiting there to picks up you and take you to Kathmandu. We will have farewell dinner in the evening with Nepalese cultural show. You will be free till your departure. A representative from Yala Adventure will take you to Airport and says good bye.